gratification, it's sometimes hard to stop and smell the roses. It may seem easier to do the fast thing, rather than do the thing that makes one feel most grateful. For example, it may seem easier to go through the drive-thru for a meal, rather than go shopping (with your children), and then go home to prepare a longer, yet healthier meal as a family. We are a society that moves quickly and doesn't have a lot of patience for even the simplest of things, like watching a commercial. I mean, why watch it when we can record the show and fast forward through the commercials instead? Life is about choices, and sometimes we choose instant gratification. Is that such a bad thing? I think it depends on the circumstance being considered. Regardless of our desire to have our needs met yesterday, gratitude should be expressed, valued, and taught to children. Being grateful leads to a sense of happiness, contentment, and understanding. It eases our troubles, relaxes us, and decreases our stress. It's easy to get trapped inside our own bubble of day to day struggles. Choosing to be truly grateful, has great effects on our overall well-being. When we are at peace with what we have, we are able to give back to others in a genuine manner. Teaching gratitude begins at a young age. As soon as children can talk, they are taught to be thankful. Teaching gratitude should be taught repeatedly in many different ways. Teaching a child to say thank you once is a good, but the child will likely not retain it. Teaching a child to say thank you each time something nice is done for them, and to understand why they are being thankful, will teach the child to be grateful over time. Write Thank You Notes - Teach children to write thank you notes to friends and family after receiving gifts. Donate Items - Go through clothes and toys on a regular basis, and donate items to those in need. Do this with children, and don't wait for an unfortunate circumstance to arise before donating. Teachers may choose to ask children to bring in donations for those in need. Sponsor a Child During the Holidays - During the holidays, adopt a child or family in need and provide food or toys to the family. Go shopping with children and let them pick out the items they want to donate to the child/family. Teachers may encourage children to participate in toy drives at school. Donate Your Time - Visit a nursing home with children. Bring baked goods or pictures for the residents. Have children visit and read books to the residents. Garden - Plant an edible garden to show gratitude to the earth. Share fruits and vegetables with neighbors, friends, and family. Sweet Surprise - Go through a coffee drive-through with children, and pay for the person's order behind you. Provide Work Opportunities - Expect children to work for their desires (toys, etc.). Parents may provide opportunities for children to make money. Once they have made the money needed, allow children to purchase their desired items with their own money. Students may earn "school money" to purchase items from a "school store". The list is truly endless. 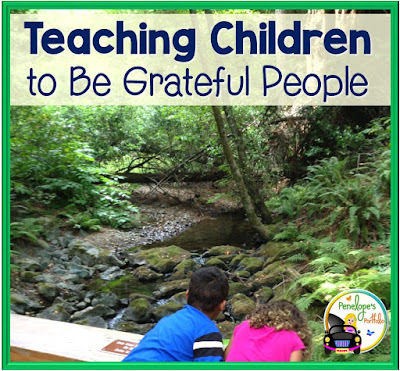 Ask children what they think are good ways to give back/express gratitude. Children always have the best ideas! 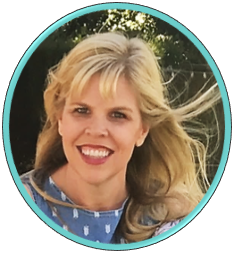 I have prepared a Gratitude Packet on activities that can be used by teachers, parents, school counselors, social workers, speech therapists, and other specialists. Included in this packet are activities, printables, posters and awards. To see full details, click here. 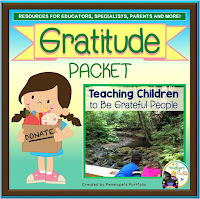 This is a great list to help start teaching children about gratefulness that a teacher OR parent could implement alsmost immediately. I've shared it on one Pinterest board, and I have it scheduled for two more. I hope you see some good traffic. :) Thank you for taking the time to link up with my Teaching Tuesday link up party. I hope to see you back each week! Thank you Heather (HoJo) for stopping by and sharing this post with others. I love linking up with your Teaching Tuesday link up parties and look forward to more link ups soon. I love these ideas. Helping children give back is such a great way to teach gratitude. Such helpful ideas. We need to be more mindful about teaching gratitude to our young ones.